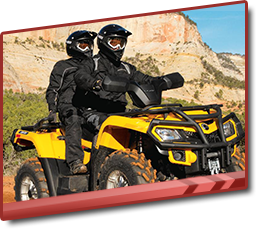 Estes Park ATV Rentals offers four wheeler rental services in Estes Park, Colorado. We’ve rented to people of all skill levels, from people who have been riding these vehicles their entire lives to those who have never been on a four-wheeler before. Our team specializes in making sure every rider feels totally comfortable on their vehicle and is ready for adventure, having learned how to properly operate their vehicle and follow the right safety precautions. If this is your first time on a four wheeler, we have some tips that can make your trip a more enjoyable one! Follow These Tips for a Fun & Safe Ride! It’s tempting to strip off your helmet or pads when out in the backcountry. Maybe you want better peripheral vision to catch sight of wildlife or the sun is warmer than you expected. It’s not worth it! Taking off your safety gear is an invitation to injury. Wear your gear and use it correctly to protect yourself and help ensure you get back safely. Don’t carry more passengers than your ATV allows. Most four-wheelers are made for one or two people and should not be used to carry more. This can throw off the balance of your vehicle and make it more prone to tip or cause you to roll it. Just let us know how many people are in your group and we’ll make sure that everyone has the ride they need! Obey all the rules of the trail. The rules on the trails are there for a reason, and that is to keep you safe. Obey all of the rules, from no littering to speed limits, and you’ll make the trails more enjoyable for everyone who uses them. This keeps the Colorado backcountry a pleasant place to explore! Plus, not following the rules could result in steep fines from various authorities, something that can really ruin your outing.